On most mandolins the nut will be made of bone/ivory, ebony or mother of pearl. The string height at the nut is vital to the comfort of a player. Since most new instruments rarely come from the factory with a great set up, adjustment of the nut and overall string height can greatly improve an instrument playability. A good indication that the nut slots may be cut/worn too low is open string buzz. The depth of the slots in the nut determine how closely the strings come to the first frets. It is critical that the string have ample room to vibrate without contacting the first fret or you'll have an annoying open string buzz. Adversely, nut slots that have not been cut properly can leave the strings higher than necessary above the first fret. This creates discomfort and can affect intonation. A minor adjustment (say .020) can make a very noticeable difference. If you've ever had to lift a string from a nut slot when changing strings it's a sure sign the slot is too small. When changing string gauges, an increase in string diameter sometimes requires an adjustment to the slots width. The slots must also be angled correctly. If the angle is too steep the string may actually rest on just a small portion of the slot causing premature wear as it is sitting on a small peak. On instruments with minimal peghead angle the angle is especially critical for a clear, clean sound. A poorly angled nut slot can create a jangly, buzz sound that can often be silenced if downward pressure is applied to the string behind the nut (over the peghead). This is often a sign that the string is not contacting the nut slot properly. The sound very closely mimics the sound of an open string buzz. There are good reason's to salvage an original nut if possible. First of all vintage instruments often have lovely ivory and or pearl nuts that are just too nice to scrap. And of course, it is cheaper, especially if you have an instrument for which no pre-made plastic nut is available. Making a bone/pearl nut for a $100 mandolin would not make much sense. My method of raising the nut is to laminate matching material to the bottom of the nut. I use the term laminate and not shim because it is glued to the nut and can only be removed by sanding. How about filling low slots and re-cutting? Superglue and baking powder have been used to fill nut slots that have been cut too low. I do not like the tone I hear from this method and prefer to raise the nut as a whole and re-cut. 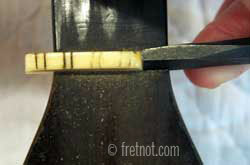 When the nut sits in a channel, flanked by both the fingerboard and the peghead veneer it is usually necessary to tap it sideways to remove it. If finish overlaps the nut it is scored to avoid chipping when the nut is removed. Some nuts sit flush against the fingerboard with no wood on the peghead side. These can be gently tapped forward, using a block to distribute the impact, to remove. Nuts must be removed for several repairs. Should a nut come loose unintentionally a drop of Elmer's glue is sufficient to secure it. It is far better to have a nut that is easy to remove than one that is practically destroyed upon removal.